It was when peak tensions between Catalonia and Spain all began, exactly one year ago. 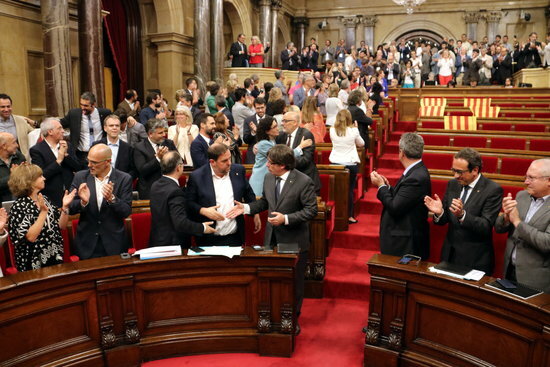 This Thursday marks twelve months since the most atypical and tense plenary session that the Catalan Parliament has experienced in recent history - maybe only after the one when independence was declared. So much so, that the main opposition party, Cs, is holding today an event called 'Never Again' to protest against what happened last year. In fact, they consider it as a 'coup d'état' by pro-independence forces. Grueling legal discussions in and out of the chamber, fussing and squabbling between pro-independence and unionist MPs, immense pressure on the speaker, criticism against the procedures, countless interruptions of the session, and the public watching it on TV in disbelief and uncertainty. Despite the complexity and intensity of those days, one thing was clear: the long-expected clash of wills between the Catalan and Spanish administrations over the referendum had started. Months of crossfire between Barcelona and Madrid were over, as the process was in full motion. A negotiated solution to avoid a non-agreed referendum on October 1 seemed impossible. The actual struggle for and against the vote started the night of September 6, and three frantic weeks followed. The session started with the pro-independence parties asking for an alteration of the order of the day to discuss and vote on the referendum bill, which was already deemed controversial. In the end this request was accepted by the speaker at the time, Carme Forcadell. She is currently in pre-trial prison, along with eight other politicians, and faces charges of up to 30 years in jail. Former vicepresident Oriol Junqueras and former minister Raül Romeva, also behind bars, published a letter supporting her one year after she allowed the vote to go ahead. They used an article of the Parliament's regulations to do so. Spain's Constitutional Court had temporarily suspended a fast-tracking process to pass bills – which was lifted months later. Things went back and forth in the chamber between those in favour and against holding a referendum, with a number of recesses at the unionist parties' request. Meanwhile in Madrid the Spanish prosecutor was already announcing criminal lawsuits against the Parliament bureau members who had brought the bill to the floor. In the end, the referendum law was passed at 9.15pm. 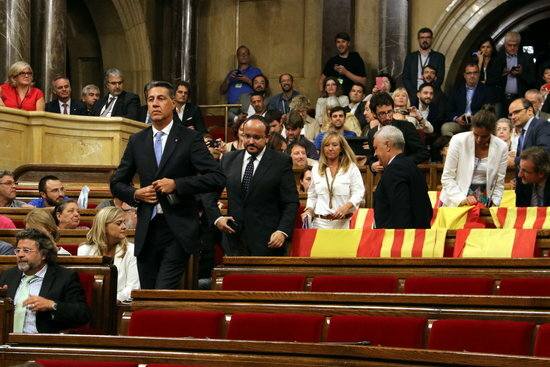 Unionist parties did not attend the final vote, with MPs from the People’s Party leaving Spanish and Catalan flags in their seats – which were then removed by a left-wing Catalunya Sí que es Pot MP. But the night was not over yet. The law was signed by the then President Puigdemont and published in the official gazette, and on the brink of midnight the Catalan government officially called for the October 1 vote on independence. In the small hours of September 7, a website on the vote and official ads were already up and running. 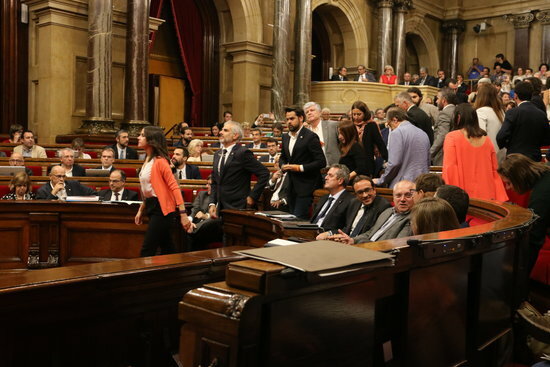 And in the afternoon, the session resumed with a similar narrative: the parties in favor of a Catalan state urging an alteration to the order of the day in order to pass the transition law, and four recesses at the unionists' request – branded as "filibusterism" by the pro-independence camp. At 12.15am on September 8 the Parliament passed the law. Unionist MPs were not present in the hemicycle. Yet some three hours before that, the Spanish Constitutional Court suspended the law and decree calling the referendum – only 24 hours after it was passed – as it would go on to do with the transition law shortly afterwards. But the courts would not be the only ones taking action against the vote in the days that followed – the police forces had a relevant role in Spain's attempts to stop it in the run-up to October 1 and the very same referendum day.